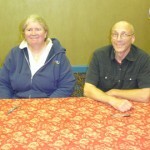 On October 20, Kage Baker and Eliot Fintushel were our guests. Before the readings, Eliot played the theremin for a rapt audience. He later read “How the Little Rabbi Grew,” which appeared recently on Strange Horizons. Kage read “The Carpet Beds of Sutro Park”, her newest Company story. Afterwards, we had signings and general fun hanging out. 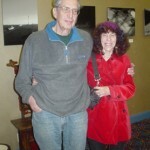 Writer Richard Lupoff and his wife Pat hang out before the readings. 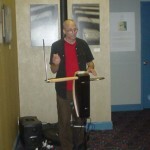 Eliot Fintushel plays the theremin. 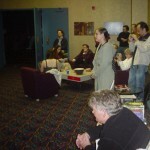 The early crowd watches Eliot play the theremin. 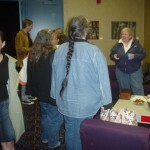 Terry Bisson is in the foreground. Kage Baker and Eliot Fintushel prepare to sign books after the readings. Kage Baker holds forth after the readings.